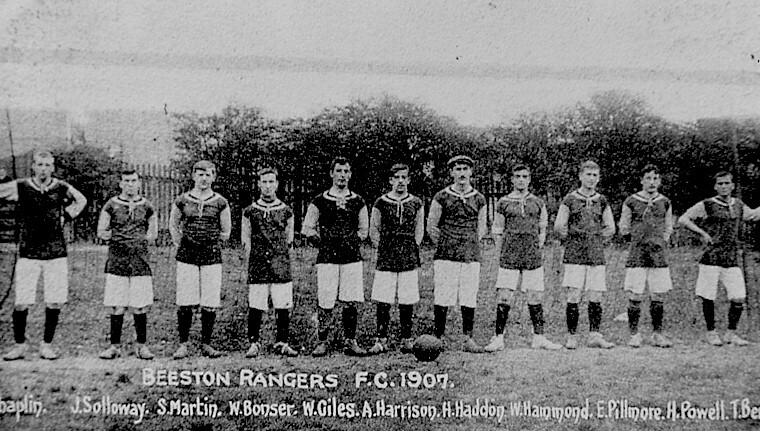 This picture from 1907, showing the Beeston Rangers Football Club team, helpfully gives most of the names. Using these, it is possible to identify most of them by using the 1901 and 1911 census. CHAPLIN : probably Arthur Chaplin, b. 1886 in Beeston, an office boy in the Humber cycle works in 1901. He was the son of William (an iron turner at Humber) and Laura (née Thorn). In 1901 the family was living at 43 Humber Road, Beeston. He married Edith Alice Veal in 1908 and, by 1911, they were living at 12 Willoughby Street, Beeston with their two children. He was then working as a brass turner. J. SOLLOWAY : apparently John Henry Solloway, b. 14 March 1883 in Beeston, a cycle fitter in 1901. He was the son of John (a self employed jobbing gardener) and Bridget Ellen (née Mellody, m. 1868, Stourbridge). In 1901 the family lived at 3 Lower Regent Street, Beeston. He married May Gibson in 1906 and, by 1911, he was working as a turner in the motor industry in Birmingham. He was then living there with his wife and three children, having apparently moved there with his family after the closure of Humbers in Beeston in 1907. S. MARTIN : apparently Samuel Johnson Martin, b. 15 July 1882, Beeston, a machine fitter in 1901. He was the son of Alfred (also a machine fitter) and Hannah (née Barson). They were living at 18 Chapel Street, Beeston in 1901. He married Harriett Pass in 1906 and was working as a boiler fitter at Beeston Boilers by 1911. He was then still living at 18 Chapel Street, Beeston, with his wife, two children and his unmarried older brother. He died in 1938, aged 55. His wife Harriett's youngest brother, Morris Edward Pass, was killed at Gallipoli in August 1915. W. BONSER : probably William Bonser, b. 1879 in Beeston, a lace maker by 1901. He was the son of Joseph (also a lace maker) and Mary Ann (née Robinson). In 1901 the family was living at 56 Wollaton Road, Beeston. In 1907, he married Rose Jane Coupe and, by 1911, they were living at 24 Park Street, Beeston with William continuing to work as a Leivers lace maker. W. GILES : apparently William Giles, b. 21 November 1876, Beeston, a machine fitter in 1901. His parents were John (a hay trusser in 1901 but previously a carter and coal higgler) and Rebecca (née Hallam - a sister of this site owner's gt-grandfather). The family was living at 15 Windsor Street, Beeston in 1901. He married Elizabeth Stenson in 1904 and was working as a miller for a radiator and boiler maker by 1911. The couple had, by that date, had three children although only one son had survived infancy. They were living ay 9 Windsor Street, Beeston. A. HARRISON : probably Arthur Harrison Cox, b. 1882, Beeston, a cycle fitter in 1901. In 1901, he was living at 84 Lower Regent Street, Beeston with his father, George, who was working as a labourer at Humbers and his mother, Eliza Cox. In 1911, he continued to work as a cycle fitter, having married Annie Swain (as Arthur Harrison) in 1904. They were then living at 3 Chapel Street, Beeston with a four year old son. Another of their children had died in infancy. H. HADDON : probably Henry Haddon, b. c1889, Beeston, the son of Henry (a brewer's labourer) and Alice (née Britton). In 1901 they were living at 2 Evelyn Street, Beeston. By 1911 he had moved to Coventry, undoubtably as a result of Humbers move there in 1907. He was unmarried, boarding with John & Sarah Shirley - who, it appears had also moved from Beeston - and was working as a painter in the motor industry. W. HAMMOND : probably William Henry Hammond, b c1887, Swinstead, Lincolnshire. In 1901 he appears to have been working on a farm in Sutton Bonnington but, by 1909 he had married Kate Elizabeth Ward and moved to Beeston where, by 1901, he was working as a labourer for lace machine builder and living with his wife and daughter at 16 Church Lane, Beeston. E. PILLMORE : probably John Edward Pillmore, b. 1886, Beeston, a worker in the lace trade in 1901. He was the son of William (a coal miner) and Mary Frances (née Naylor). The family was living at 27 Denison Street, Beeston in 1901. In 1909 he married Hannah Dawes and, in 1911, he was living at 2 Roberts Yard, Beeston with his wife and their seven month old daughter. He was then working at a foundry as a labourer.